Animated content will air on Cartoon Network and on cartoonnetwork.com, featuring the colorful Mixels creatures that can mix and combine with one another in creative and unpredictable storylines. A collectible portfolio of low-priced mini building sets will launch in three waves in 2014 and an app-powered gaming experience will engage fans in a deep mobile game that will cover the sprawling world of Mixels. Mixels was developed through a true collaboration between Cartoon Network, a leading global kids entertainment company, and The LEGO Group, globally renowned for its heritage of quality, creative play experiences. The two companies joined forces when Cartoon Network Studios had an interest in creating original content based on the inherent open-ended values of LEGO play, at the same time that The LEGO Group was exploring a new concept involving small creatures – and Mixels was born. The property was developed by a multinational team of content innovators, designers and animators – from Los Angeles to Atlanta to San Diego to Connecticut to Denmark. As an afol these are not remotely something id be interested in. However I can see the yellowish bush piece used as a head being very useful for moccing…. I do not want to offend anybody, but, I don’t like the idea I think its a waste of LEGOS money. but I agree with you tom, the yellow “ish” brush piece is great for moccing!!!!!!!!!!!!! What I AM crazy about though are the small ball and socket pieces; they could be implemented really well in a lot of my builds. me too! little ball and scockets are a great idea! Adorable!!!!!!!!!!!!!!! I want all of them!!!!!! This looks interesting. I cant wait for their names! Must get some of those ball-joints. Of the three Lego fans in this house two will have no use for them and the third will love love love them, both for their cuteness AND for the usefulness of the parts. I don’t know but I’ll buy Mixels any day instead of Galidor! Mixels look okay. I could use those parts for a lot of stuff. I would only get those stuff for the parts in it. I’d rather make a robot than a weird looking monster! Ahhhhhhhhhhh! My eyes! It burns!!!!!!!!!! As far as the pieces… I don’t see them being extremely useful (for me at least), but I’m interested in seeing where this theme goes. Strikes me as though it has a good bit of potential. I’m not sure I see them under five. Judging by the box size, they look more like ten. Though going by fig size, five does make sense. The box IS kind of big… I am speculating that there are more pieces to make alternate models or add-ons, that would justify the box size. Too bad there is no piece count on the preliminary box art to certify that. Yeah, for so few pieces the box size doesn’t quite make sense. Though I do wonder what kind of add-ons there would be. goofy little things. not something I would buy, but the yellow one is best. Very interesting. I totally see here that they are trying to do some kind of Pokemon theme creatures with abilities. I think since most of the person commented want to put them apart for pieces, this new waves might be for the youngest LEGO crowd. I think they might have something here that can be really popular towards young one. Reminds me a bite of that game on console with figurines that you step on the pedestal to play on game with. Definitely, this could be a flop or a total success. 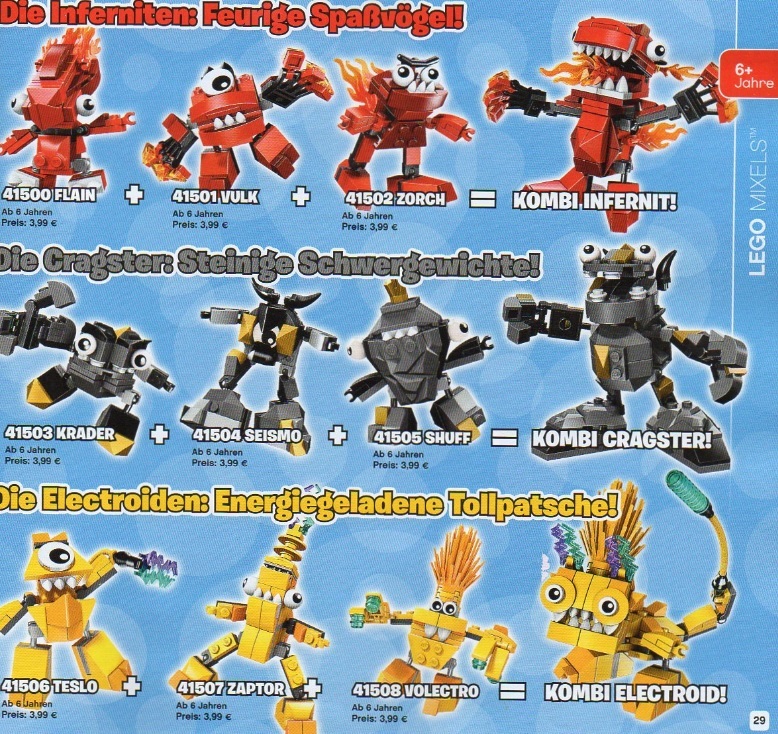 WHY LEGO WHY ARE YOU GOING TO RELEASE THE WORST LEGO IDEA EVER KNOWN TO MAN.Lego please learn from The Lego Communites early reaction that you do not need to release these. Galidor is worst than this. Click the link and be blinded. I love LEGOs. But I won’t be spending my money on these. I’ll stick to the other themed sets and HERO Factory. They kinda remind me of Pokemon…. I am 47 and have recently started my 2nd Legohood. Collecting technic lego and cintage 70s stuff. I love colourful things and robots so I decided to buy some of these little creature. I am now seriuosly concidering collecting all of them. Welldone Lego and CN I love the short cartoons and wished they were computer animated. Previous post: LEGO The Hobbit Lake Town Chase coming!